All three were shot on low budgets in southern Italy. Their American actors -- Clint Eastwood, Lee Van Cleef and Eli Wallach -- had no box-office followings. Most of the other actors were unknown Italians, largely amateurs, with their English dialog dubbed. Yet "The Good, the Bad and the Ugly" and its two predecessors have been great successes during a period when many U.S. Westerns have bombed. Their secret, I think, is their understanding of the Western bad man: mysterious, without a name, absolutely ruthless. The Dollars have no good guys to dilute the action. They also gain immensely by being shot on location in Italy. The back lots of Hollywood studios have been worn smooth over the years by countless posses, but the landscape of the Dollars looks barren and deserted. These are new Old Hills. And they are populated by cheap Italian extras, apparently chosen because of their appearance rather than their acting ability, if any. All three movies are filled with close-ups of memorable faces, and these are not Hollywood extras with stuck-on whiskers but Italian peasants who have worked in the sun all their lives and will go back to work tomorrow. Most of them -- like the legless beggar or the witnesses at the hangings -- populate scenes only a few minutes in length. Yet they supply atmosphere, like those strange people who hover in the shadows of Dickens novels, and when the beggar crawls into the bar and says, "Hand me down a whisky," that is the kind of macabre detail unthinkable in Hollywood. 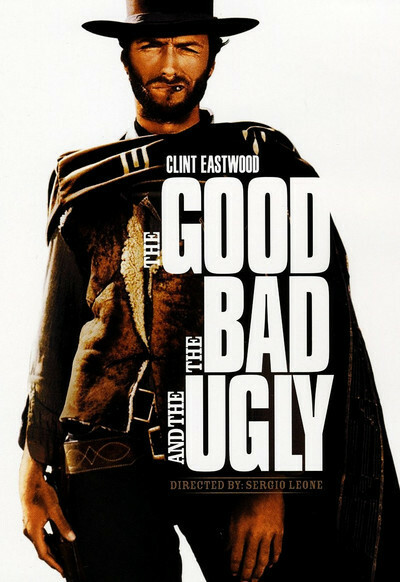 "The Good, the Bad and the Ugly" has only the thinnest of plots: Three criminals are searching for a gold shipment during the Civil War. But the plot hardly matters, because the method of director Sergio Leone is to create a series of short, self-contained scenes. There are some good ones, as when Wallach finds a wagon of dying and dead men in the desert or when two men hire Van Cleef to kill each other, and he does. There is a fine scene in which Leone's style seems to follow Hitchcock's. Eastwood is shown in his hotel room, taking apart his pistol to clean it. Horse-drawn cannons are being pulled down the street. Their rumble covers the clink of the spurs of three hired killers, coming upstairs to Eastwood's room. Leone cuts back and forth: the spurs, the cannons, Eastwood's pistol being put back together. Then he releases the suspense with split-second timing. Then, like Hitchcock, he ends the scene with an ironic, unexpected twist. "The Good, the Bad and the Ugly" is probably 30 minutes too long, but it's filled with good stuff like that for those who treasure Westerns.